NOTE: Thanks to Rachel, who suggested more articles about baby horse experiences. I don't remember where I first read this wonderful piece of advice--on a bulletin board, I think, maybe COTH? At any rate it's worth sharing. 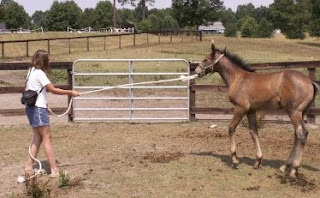 Attention young horse owners: Get your baby horse used to a lead rope dragging on the ground and banging against them. Do this BEFORE you try to teach him/her to lead, especially if you won't be working in an enclosure. Why? If a youngster gets loose from you he/she may run in terror from the thick "snake" that is chasing them. A panicked baby is at risk for injury, It's easiest to take a few preventive measures to avoid that situation. According to the source I don't rightly remember, the safest place to introduce the "dragging lead rope" is an empty stall devoid of -- well, everything -- everything but soft bedding. Put a leather halter on the youngster, and attach a thick, soft lead rope. Then just step out of the stall and monitor the situation closely. Most likely the youngster will run around the stall until he/she gets used to the feeling. When Riley was a 6 month old weanling I had no access to a stall or pen. I needed to work with him on basic handling, but my only "work space" was a 9 acre field with a run-in shed and three other baby horses. If he got away from me while he was in-hand, he might run from the dragging lead rope and get himself hurt. What to do? For better or worse, I modified the technique. Disclaimer: I'm not recommending this, I'm just sharing my successful experience. I can only say that it worked with my one admittedly mellow fellow. a thin leather halter that fits. I loop the rein or reins through the bottom ring of the halter (for control). I loop the thick soft rope through the bottom of the halter (not through the ring, just somewhere under the chin). I pull it through so there is about 5-6 feet of rope on the left side (the side I'll be on) and 2-3 feet on the right. If Riley spooks at the dragging rope, he is more likely to jump away from me. Standing on his left side, and holding the rein ends in my right hand, I encourage Riley to walk forward. Once Riley gets used to the dragging rope, I pull the existing rope through the halter so that it is about equal length on both sides and more likely to fall against him. I lead Riley some more and let him/her get used to that feeling. What if Riley had freaked? Well, he didn't. Riley was more perplexed than afraid, and after we walked a bit he ignored it. If Riley had panicked, I could have released one rein and let it pull through as he ran away. In theory, the dragging rope would pull through too, from the weight of the rope and friction of the ground. However, a quick-thinking handler could grab one end of the dragging rope and let it pull through. The stall method is the preferred method, for sure. The pasture technique? I guess it's pretty safe, with these caveats. A hot-headed baby can always find a way to hurt himself/herself. I maintain that the risk is smaller than the risk of leading a youngster without any preparation of this sort. If the baby panics, and the rope pulls free, the baby is at least safe, but nothing is gained.If the rope does not pull through right away, or does not pull through at all, you have a problem, but I don't think it would stay attached to the halter if the baby was really running. Letting the youngster pull away/break free repeatedly will encourage/reinforce a bad habit. That's never good. I guess it's a matter of which risk you want to take -- the risk of injury or the risk of a horse that tries to break free of the handler. I think leading him with a dragging rope temporarily confused Riley about leading cues. At the time he was just learning to lead, and my asking him to move forward was in conflict with the backward pressure from the dragging rope. Fortunately, you don't have to do the "drag a lead rope" technique more than once or twice. I welcome any critiques, improvements, experiences from others. Am I overstating the risk of a dragging rope? Are there better methods? Is this too darn complicated? Thank you for this one! 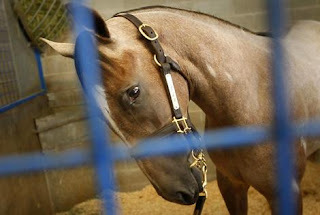 I lost a very special yearling filly who got away from her handler with the lead "chasing" her. She had remarkable speed until she hit the fence wide open and crushed her trachea. She died about 90 seconds later. RIP Ella. We have used a drag line in a stall or stall-sized pen to desensitize our horses of all ages ever since. Also, babies love to put things in their mouths and then frighten themselves as the lead rope, feed bag, etc chases them which can provide for some amusement but also can be scary, so it is always advisable to have your foals in fairly injury proof pastures, arenas etc. That works if you have the baby from the get go -- I bought Riley at 3 weeks but he was 4 hours away -- didn't really own him till he was 5 months. That truly is the best idea yet, however, those tiny babies don't have much weight to throw around and they aren't insecure as weanlings typically are.